Build a pool noodle agility ladder and add this fun gross motor activity to your backyard obstacle course! Gross motor activities are kind of our specialty around here. With four extremely active kids it was obviously from the beginning with all there running, jumping, and climbing that there was a lot of proprioceptive sensory seeking going on. With more and more children spending long hours indoors and seated for school they end up with weak gross motor skills making it important to incorporate gross motor activities into their every day learning. What are gross motor skills? These are the developmental skills that use the large muscle groups. You need goo gross motor skills in order to maintain balance, run, jump, climb, or throw a ball! 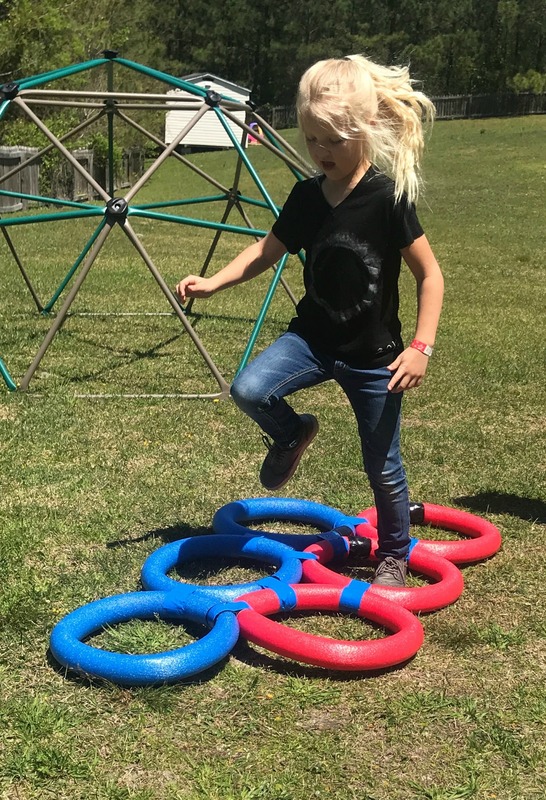 With multiple sensory seekers in the house we are always coming up with fun ways to burn off energy and work those large muscle groups with gross motor activities in a safe environment. An agility ladder is used for training athletes from just about every sport known and can be a tremendous asset to building your own child’s gross motor skills. Agility ladder training helps to strengthen your joints, ligaments, and tendons while improving coordination and focus and working those large muscle groups. You don’t have to go out and buy an agility ladder to have some fun with it though! We’ve added a pool noodle agility ladder to our backyard with just a few pool noodles and some duct tape. Using pool noodles makes it fun for the kids and inexpensive to make. 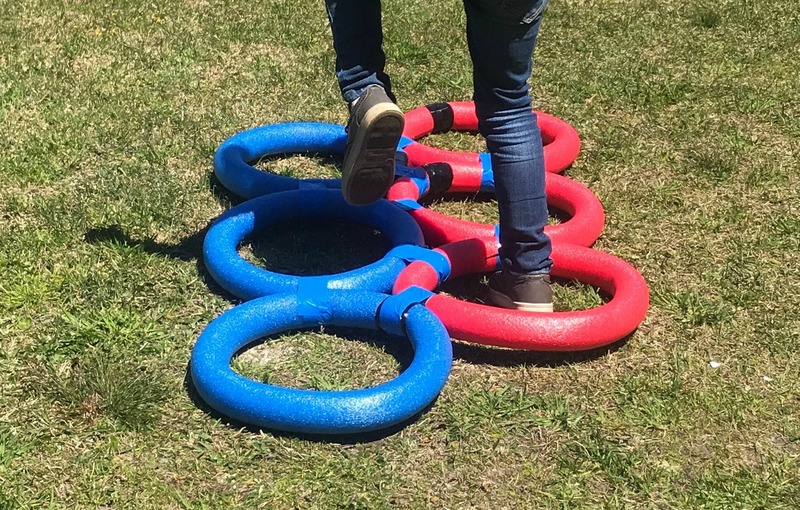 You can use this with your own children, a physical education class, incorporate it into an obstacle course, or add it to a fun birthday party game! To make the pool noodle agility ladder you will first need to gather your supplies: 6 pool noodles and a roll of duct tape. Fold each noodle into a circular shape and use the duct tape to secure the ends. When you have each of them made into circles align them on the ground, staggering just a bit. Secure the pool noodles in place to form a ladder!